Actions in Ottawa and Toronto as ACORN demands the Province supports tenants and OW/ODSP recipients! Twenty-three Ottawa ACORN members picketed outside of the ODSP office to demand that Doug Ford's government stops the cuts and raises the rates! Ottawa ACORN board member, Blaine Cameron, led the action and called on Minister Lisa MacLeod to spend one day in his wheelchair to really see the impact of her attacks on social assistance. Members wrote on posters what Lisa MacLeod would experience if she was forced to live one day in Blaine's chair, based on their personal experiences of living on ODSP. 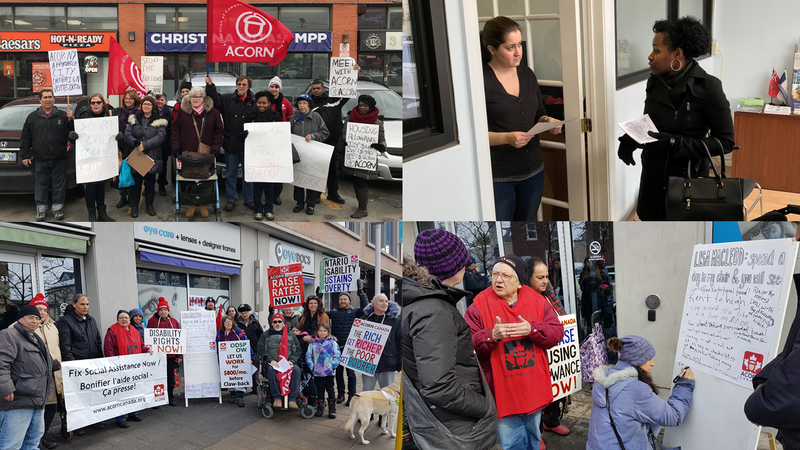 Fifteen ACORN members from across Toronto came out to MPP Christina Mitas' constituency in Scarborough Centre, to let her know that the Ford Government needs to respect tenants. Members told her staff about the problems in Toronto Community Housing buildings, and the need for money from the Province to ensure tenants aren't living with mice, roaches, and broken down units. ACORN members were also there to protest the Province’s plan to make it easier for landlords to evict tenants. The government’s disregard for tenants is unacceptable, particularly in the midst of a worsening housing crisis. We need more affordable housing, not more homelessness. The MPP's office pledged to follow up with a meeting when the MPP is back from a short leave. ACORN members will be sure to make sure this isn't the last time she hears from us!